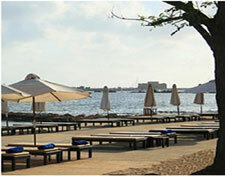 Annabelle is a five star luxury hotel resort, situated on the Mediterranean shores of Paphos. It is very centrally located, being the closest hotel in Pafos to the old fishing harbour and castle, as well as the archeological sites of Pafos. It offers discreet, understated elegance and stylish accommodation, providing an ideal year round holiday retreat in Cyprus. Situated in six acres of lush tropical gardens, cascading waterfalls, and free-form pools, the family-owned, five star hotel has 218 rooms and suites, all luxuriously furnished and each with its own private terrace or balcony. Annabelle boasts a number of Suites with magnificent views to the azure Mediterranean Sea and the hotel�s gardens. All suites feature marble fitted bathroom facilities, complete with Jacuzzis, comfortable sitting and dining areas and spacious balconies, and some with outdoor whirlpools or private plunge pools. Furnished with impeccable taste, they are the perfect choice to chill out in an elegant yet relaxed atmosphere. The hotel�s four restaurants offer everything from gourmet cuisine served at Asteras, Fontana and Amorosa Restaurants to authentic Cypriot fare accompanied by live music at Mediterraneo. A wide selection of bars is also available for thirst quenching cocktails. Leisure facilities include tennis and squash courts, and a half Olympic-size heated swimming-pool. Annabelle guests may avail of a wide range of spa and beauty treatments at AlmyraSpa located directly adjacent to Annabelle, such as massage and facials, as well as sauna, steamrooms and an indoor pool. During the summer, a variety of water-sports are available on the beach and the mild winter climate makes Annabelle an ideal destination for golf lovers. Annabelle�s younger guests can take advantage of the family owned Thanos Hotels adjacent five star family resort, Almyra�s Smiling Dolphin Children Club and Baby Go Lightly Cr�che with its fun filled programme of educational activities and games. Guests of Annabelle may also enjoy signing privileges at Almyra, and may utilise their half and full board supplements at either hotel. Annabelle is a member of Preferred Hotels and Resorts.